You'll be £14.99 closer to your next £10.00 credit when you purchase Churchill's Anchor. What's this? Dudley Pound served for longer on the Chiefs of Staff Committee in wartime than any other serviceman in either of the two World Wars. He was the professional head of the Royal Navy from July 1939 until his resignation, shortly before his death, in August 1943. He had to cope with the problems of Hitler by day and Churchill by night, of trying to make the old ships of the Royal Navy face the challenge of the modern navies of Germany, Italy and Japan. Pound had to run the operational HQ of the Admiralty while also chairing the Chiefs of Staff Committee. As such he was involved in some of the most controversial decisions in the Naval War in Norway 1940, the sinking of the French Fleet, the despatch of The Prince of Wales and Repulse to Singapore, the scattering of convoy PQ17 while, all the while, courageously fighting failing health and enduring huge strain. However by the time of his death the Battle of the Atlantic had been won and the Mediterranean cleared. 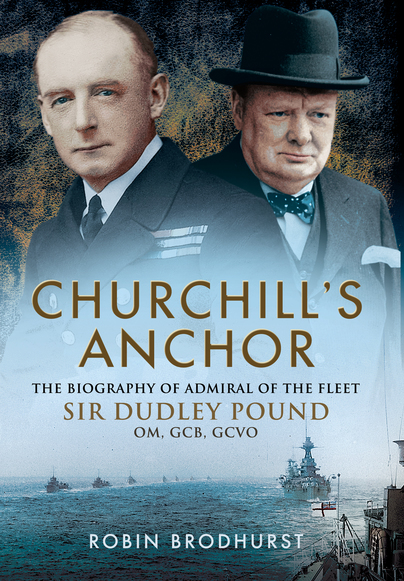 Churchill's Anchor aims to put Dudley Pound's achievements into context. He held a succession of key commands from a battleship at Jutland to the Mediterranean fleet for four years, alternating with key appointments at the Admiralty. He was at the centre of naval affairs from 1914 until his death in 1943. This biography of Admiral of the Fleet Sir Dudley Pound, first published by Leo Cooper 2000, has been reprinted by Pen and Sword and is to be welcomed as it sheds light on that somewhat shadowy figure in the naval uniform who is often seen in photographs trailing in Winston's Churchill's wake. It also provides a fresh angle on some of the hugely controversial decisions taken at the highest level during the Second World War. After all of the books about WWII, published over some 70 years, it is surprising that there are still important figures and events that have either not been covered, or have received brief mention. Sir Dudley Pound is one such figure. This book goes a long way to correcting the omission in respect of Sir Dudley, and also sheds fresh light on key events. It is an easy read and includes some good photo plates in support. Essential reading and strongly recommended. This books aims to put Dudley's achievements into context. He was at the centre of naval affairs from 1914 until his death in 1943. Pound was First Sea Lord from 1939 until his death in 1943, in an absolutely pivotal position in the crucial early years of the War. This period takes up, quite rightly, 60% of the book but first we are led very capably through Pound’s earlier years. From young naval cadet to early-promoted Commander and then Captain his reports show him as a brainy, far-sighted, thoughtful and innovative officer. He climbed the ladder entirely on his own ability, having neither interest nor private money; his virtues however were clear to his seniors. This work is a well-compiled, and long overdue tribute to a man who put duty before all else - and expected others to do the same. In rehearsing Sir Dudley Pound’s career it brings all manner of detail that subtly changes even the well-informed reader’s perception of the first four years of the war at sea, while at the same time being remarkable sound and informative on the political and global strategic background, and on other personalities such as Brooke, Portal and the American admiral Ernie King. I warmly endorse this book for all with an interest in our naval history.